The first stone has been cast…..
Update: Article about Bitcoin “issue” being worked out…. JOIN US! 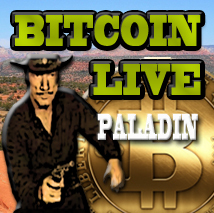 TONIGHT …Wednesday, Jan 29th, 7pm EST / 4pm PST — On the Camelot Livestream Channel I will be talking with Paladin from the White Hats (currently a columnist here on the Camelot site), all about BITCOIN. Why it differs from fiat currency and the efforts of the PTB to stop it from replacing our monetary system. Paladin is uniquely qualified to weigh in on this topic as a forensic financial investigator with a background in corporate and government agency contracts. As a member of the website responsible for the investigation and publishing of a number of reports following the money into black projects and down the rabbit hole (tdarkcabal.blogspot.com/ ) his views of this current challenge to the corrupt monetary system should be fascinating and enlightening to those who will take the time to listen.